Lynnette Hardaway and Rochelle Richardson, popularly known as Diamond and Silk, are American live-stream video bloggers, social media personalities, political activists and Fox Nation Host. They are known for their commentary in support of United States President Donald Trump. The duo received media attention during the 2016 campaign and again in April 2018 when they alleged that Facebook had notified them they were "unsafe to the community." In response, they accused Facebook of blocking and censoring their Facebook page. There is, however, no evidence that Facebook blocked or censored Diamond and Silk's Facebook page. On April 23, 2018, Rep. Steve King (R-IA) announced that the duo had accepted his invitation to testify in front of Congress apropos their perceived censorship. Subsequently, Republican members of Congress brought up the duo's censorship claims at Mark Zuckerberg's testimony before U.S. Congress. Formerly lifelong Democrats, they became Republicans soon after they saw Trump announce his candidacy on television. According to Hardaway, "When he announced and we heard everything that he stood for, it was on and poppin’, and we’ve been on the Trump train ever since." They came to wider prominence in 2015 as Trump supporters after posting a video criticizing former Fox News host Megyn Kelly for asking what they considered irrelevant questions during the first Republican presidential debate. Although officially unaffiliated with the Trump campaign, they urged support for Trump via social media efforts and rallies and traveled to three states for the campaign. The duo first joined Donald Trump as the "Stump for Trump Girls" on stage at his Raleigh, North Carolina, rally on December 4, 2015. They later warmed up the crowd at the Trump rally on January 2, 2016, in Biloxi, Mississippi. They initiated a "Ditch and Switch" campaign to encourage Democrats to register as Republicans and created a website explaining to voters which states had closed primaries and when the deadlines were for changing party affiliations. On November 2, 2016, Diamond and Silk appeared with Lara Trump, wife of Eric Trump, in Winston-Salem, North Carolina, on behalf of the Trump campaign. They were paid $1,274.94 for field consulting work by the Trump campaign. They regularly appear on Fox News shows including Hannity, Fox News Sunday, Watters' World, and The Ingraham Angle, and Fox & Friends. In November 2018, Diamond and Silk were given a show on Fox Nation, the online Fox News streaming service. They were covered on ABC's Nightline. Hardaway is notably more talkative, while Richardson often just expresses agreement. A documentary film by Hardaway and Richardson titled Dummycrats premiered in October 2018 at the Trump International Hotel Washington, D.C.. Following the controversial Unite the Right rally held in Charlottesville, Virginia, on August 11 and 12, 2017, Hardaway and Richardson, appearing on Fox & Friends, were critical of protesters on both sides in the event. Hardaway criticized Neo-Nazi groups and the Ku Klux Klan for "spewing hate and ... creating violence" declaring "all of them should be condemned and denounced. Period". In the same interview, she also said she does not "... like Black Lives Matter and Antifa." They further noted that they feel statues of Civil War Confederate soldiers should be kept in museums. Hardaway and Richardson, in December 2017, expressed support for Omarosa Manigault Newman following her controversial firing as White House liaison and assistant, faulting the treatment of her by African Americans and the media generally: "What I find appalling, to my brothers and sisters [is] how you ... can laugh at, pick at, gloat at somebody because they either left the White House or you listened to a salacious story that Miss Piggy went around, running around telling everybody." In the same live-stream, they criticized Good Morning America anchor Robin Roberts for saying, "Bye, Felicia" to Newman during a segment on the ABC show which aired on December 14, 2017. Addressing Roberts' remarks, Hardaway said, "How is it that you want the community to come up and then when a sister is sitting at the table, 'Well, she didn’t represent us'? Are you crazy?" Artist and activist Bree Newsome has described Hardaway and Richardson as "a modern-day minstrel show" and stated in an interview that the pair's presentation relies on "stereotypical images of black women". Columbia University professor Keith Boykin argued that, "the way they speak, the way they talk and act and behave [... if they] were saying anything that was contradictory to Trump, the Trump supporters who defend them would be the first to attack them." Boykin argued that conservatives give attention to Hardaway and Richardson because they "only want to listen to the people who reaffirm their narrow, limited vision of what blackness is all about and how black people should perceive white people and specifically how they should perceive Donald Trump." Hardaway and Richardson have asserted that YouTube has discriminated against them through demonetization of their channel because of their support for Trump. In an April 2018 tweet and Facebook post, Hardaway and Richardson reproduced a message from Facebook stating that the Diamond and Silk Facebook page's content and brand were deemed to be "unsafe to the community." According to Hardaway and Richardson, the message sent from the Facebook policy team concluded with: "This decision is final and it is not appeal-able in any way." The pair stated that they believed that they had been victims of censorship by Facebook after receiving a communication from the social media website's policy team. According to Diamond and Silk, they had started questioning Facebook via phone calls, emails, and chat sessions as to their alleged "bias censorship and discrimination against D&S brand page" in September 2017. Both women have stated a reduction in reactions to their posts and videos since that time period and that followers no longer receive notifications about posts and videos. As of April 2018, their Facebook page states they have nearly 1.3 million followers. Diamond and Silk's censorship claims were repeated in right-wing media. According to CNN, Diamond and Silk's claims likely influenced an April 2018 congressional hearing which involved Mark Zuckerberg after the Cambridge Analytica scandal. Business Insider notes that Diamond and Silk were a "frequent topic" during that hearing. Tennessee Republican Representative Marsha Blackburn finished her questioning of Zuckerberg by stating, "Let me tell you something right now, Diamond and Silk is not terrorism". Texas Republican Representative Joe Barton asked Zuckerberg, "Why is Facebook censoring conservative bloggers such as Diamond and Silk?" Zuckerberg responded that Facebook employees had made an error and they had contacted Hardaway and Richardson. While there is no evidence that Diamond and Silk were censored or that their page was blocked by Facebook, the pair continues to contend it was. Facebook's own analytics firm showed that the Diamond and Silk page had not lost a significant amount of influence on the social network. By the time that Diamond and Silk spoke at a congressional hearing about their censorship claims, news outlets such as CNN and Business Insider described their censorship claims as debunked. At the hearing, experts testified that there was no evidence that Diamond and Silk had been targeted. According to The Washington Post, "the numbers do not bear out the argument that the sisters have been repressed." Diamond and Silk stated that Facebook had not contacted them. Facebook said they attempted contact via email, Twitter, phone, and Facebook Messenger. Diamond and Silk later said that messages sent to them through email should not be expected to be read, because they receive many emails. On April 26, 2018, they appeared at a House Judiciary Committee hearing on alleged filtering practices of social media platforms. Representative Sheila Jackson Lee asked the duo if they had ever received money from the Trump campaign, to which Hardaway responded, "We have never been paid by the Trump campaign." Representative Hakeem Jeffries suggested that they could be committing perjury and showed them a Federal Election Commission filing which reported that the Trump campaign paid them $1,275 on November 22, 2016 for "field consulting". Diamond and Silk then stated that the payment was reimbursement for the cost of airplane tickets. Following their testimony, the Huffington Post reported that, according to Trump campaign treasurer Bradley Crate, the payment had been categorized incorrectly. Crate stated, "The Campaign’s payment to Diamond and Silk for field consulting was based on an invoice they submitted reflecting their costs for air travel to a Campaign event. The invoice was not supported by accompanying receipts, so as a technical matter, could not be reported as a reimbursement even though its purpose was to make them whole for their out-of-pocket costs." In the same Huffington Post article, it was reported that following a $7,025 payment from the campaign of Paul Ryan primary election challenger Paul Nehlen, Hardaway and Richardson made a campaign video but they did not endorse Nehlen. 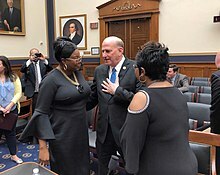 ^ "Diamond and Silk Testimony to House Judiciary Committee" (PDF). Judiciary Committee, US House of Representatives. ^ "Diamond and Silk UNCENSORED: Duo Accepts Steve King's Invitation to Testify". ^ Romm, Tony (July 17, 2018). "Republicans accused Facebook, Google and Twitter of bias. Democrats called the hearing 'dumb.'". The Washington Post. ^ a b Tessa Stuart (September 28, 2016). "Meet the Black Women Defending Trump's Record on Race". Rolling Stone. Retrieved January 28, 2018. Like Trump himself, Diamond and Silk are new to the Republican party. Lifelong Democrats, they switched parties so they could cast their votes for him in the North Carolina primary. ^ Foran, Clare (January 29, 2016). "Meet the YouTube Stars Trying to Convert Democrats to Team Trump". The Atlantic. Retrieved April 8, 2018. ^ Lanktree, Graham (August 10, 2017). "PRO-TRUMP YOUTUBERS DIAMOND AND SILK 'BUILD THEIR BRAND' WITH A HAND FROM THE TRUMP ADMINISTRATION". Newsweek. Retrieved April 8, 2018. ^ a b Supporters Seek to Persuade Democrats to ‘Ditch and Switch’ for Donald Trump, New York Times, January 7, 2016. ^ Donald Trump Supporters Diamond and Silk a Comedy Act?, Liberty Voice, December 9, 2015. ^ ‘Stump for Trump’ duo rock capacity crowd at MS rally, The American Mirror, January 3, 2016. ^ "Diamond and Silk, Lara Trump bring Women for Trump tour to Winston-Salem". Winston-Salem Journal. Winston-Salem, North Carolina. November 2, 2016. Retrieved November 18, 2016. ^ "FEC Donald J. Trump for President, Inc. Itemized Disbursements". Retrieved April 30, 2018. ^ Morris, Melinda (March 20, 2018). "Fox News darlings Diamond and Silk bringing 'Chit Chat Tour' to New Orleans". NOLA.com The Times Picayune. Retrieved April 9, 2018. ^ Swanson, Ian (November 26, 2018). "Trump supporters Diamond & Silk awarded program on new Fox News streaming service". TheHill. Retrieved November 26, 2018. ^ "Diamond & Silk Get Their Own Weekly Fox Nation Series". TheWrap. November 26, 2018. Retrieved November 26, 2018. ^ Marjorie McAfee, Ashley Louszko, Byron Pitts, (April 5, 2016). "A Look at Proud Donald Trump-Supporting Sister Act 'Diamond and Silk'". Retrieved April 9, 2018. ^ Gutierrez, Lisa (April 10, 2018). "Mark Zuckerberg: Facebook made 'enforcement error' with Trump fans Diamond and Silk". The Kansas City Star. ^ "Social Media Stars Diamond and Silk Go to Big Screen for the Midterms". The Epoch Times. October 18, 2018. The film premiered at the Trump International Hotel in Washington on Oct. 15 and screened in nearly 800 theaters across the country for a one-night event. ^ "Trump Super-Fans Diamond and Silk Announce Michael Moore-Style 'Dummycrats' Movie". San Francisco Chronicle. June 25, 2018. Retrieved July 20, 2018. ^ a b "Diamond and Silk: We Don't Like White Nationalists or Antifa". Fox News Insider. August 13, 2017. Retrieved April 8, 2018. ^ a b Willis, Kiersten (December 29, 2017). "Omarosa Gets Defended by Diamond and Silk … and the Trump Supporters Get Dragged - You may not like Omarosa, but you don't have a right to laugh at her". Atlanta Black Star. Retrieved April 8, 2018. ^ Deerwester, Jayme (December 14, 2017). "'GMA' host Robin Roberts on Omarosa's White House exit: 'Bye, Felicia'". USA TODAY. Retrieved April 8, 2018. ^ Stack, Liam (April 14, 2018). "Who Are Diamond and Silk? A Look at 2 Pro-Trump Social Media Stars". nytimes.com. Retrieved August 5, 2018. ^ Birnbaum, Ian (September 18, 2017). "YouTube is leaving its creators in the dark". The Outline. Retrieved April 8, 2018. ^ Silk, Diamond and (April 8, 2018). Diamond and Silk@DiamondandSilk (Social media). ^ a b c d e Darcy, Oliver. "Led by Fox News, pro-Trump media fuels false narrative to accuse Facebook of censorship". CNNMoney. Retrieved April 26, 2018. the Diamond & Silk page was never banned. It was never taken down. It was never censored... The tidal wave of media coverage didn't just mislead viewers; it likely influenced the Mark Zuckerberg hearings on Capitol Hill. Several lawmakers chose to use at least a portion of their time questioning the Facebook chief to ask him about the supposed censorship of Hardaway and Richardson. The hearings were scheduled to address Facebook's use and protection of user data in the wake of the Cambridge Analytica scandal. ^ a b c d "Trump vloggers Diamond & Silk are sticking to their debunked claim about Facebook censorship". Business Insider. Retrieved April 28, 2018. Hardaway and Richardson said, as they have many times in appearances on Fox News, that they were not contacted by Facebook in any official capacity... But messages obtained by conservative commentator Erick Erickson show that Facebook reached out to Hardaway and Richardson several times through phone, Facebook Messenger, and multiple email addresses. ^ Ng, Alfred (April 11, 2018). "Who are Diamond and Silk, and what do they have to do with Facebook?". CNET.com. Retrieved April 11, 2018. ^ Kutner, Max (April 11, 2018). "DIAMOND AND SILK HIT BACK AT MARK ZUCKERBERG, FACEBOOK 'CENSORSHIP': 'WE ARE NOT TERRORISTS'". Retrieved April 11, 2018. ^ a b Darcy, Oliver. "The Diamond and Silk show goes to Washington". CNNMoney. Retrieved April 28, 2018. They had not been censored. Hardaway and Richardson's claims had been thoroughly debunked. ^ a b Bowden, John (April 27, 2018). "Chris Cuomo confronts GOP lawmaker over Diamond and Silk's claims of censorship". TheHill. Retrieved April 28, 2018. The two pro-Trump personalities allege that a number of social media platforms, including Facebook, censored their content using algorithms to prevent it from showing up on users' feeds. They have provided no evidence for they claim, which Facebook and other companies deny. In addition, the two were found to have erroneously claimed that Facebook did not contact them over their concerns, despite an investigation showing that Facebook reps attempted to reach out to the two over email. ^ a b c Hesse, Monica; Zak, Dan (April 26, 2018). "Who are Diamond and Silk? How two small-town ex-Democrats found fame as 'warriors' for Trump". Washington Post. ISSN 0190-8286. Retrieved April 28, 2018. experts testified in Congress that there’s no evidence of targeting... The numbers do not bear out the argument that the sisters have been repressed. ^ Swanson, Ian (April 26, 2018). "Diamond and Silk say under oath they weren't paid by Trump campaign; FEC filings say otherwise". TheHill. Retrieved May 2, 2018. ^ "Pro-Trump social media stars Diamond and Silk testify under oath". Retrieved April 26, 2018. ^ Nelson, Eliot (April 26, 2018). "Diamond And Silk Appear To Lie Under Oath About Trump Payments". huffingtonpost.com. Retrieved April 26, 2018. YouTube channel "The Viewers View"